Google Drive is just a new name for Google Docs, so you shouldn't expect a new service. What you can expect is a new software that synchronizes your files with Google Docs and more free storage. After going back to the Scripts tab, he clicked the "pause" button (F8) and switched to the Google Docs tab. At the moment, you can't download the Google Drive software, but it will be interesting to see if it's better than Dropbox. Please stop saying that "Google Drive is just a new name for Google Docs", that's obviously not true. Docs is already a recognizable brand. Drive evidently is a desktop addon, and they might also be calling a new service where you can browser all your Google stored files (emails included) as the GDrive, something similar to Dashboard but more interactive. @David: Office Web Apps stores its files in SkyDrive. It looks like Google is doing/going to do the same here. Think about it, you can store your docs on GDrive and upload your docs to GDrive via the downloadable GDrive app. Don't get your hopes up on something that might never happen or does happen and it isn't what you hoped it would be, like some mythical GDrive that's different that just Docs renamed. Maybe Google Drive is just a connector between the Desktop and the Internet. It might work with every possible service, such as Docs, Photos... I mean, if it is a renaming of the service it implies a change in its purpose, and that would be really strange, in my honest opinion. "What you can expect is a new software that synchronizes your files with Google Docs and more free storage"
Yeah I'm actually hoping that GDrive is a connector between the desktop and the Web. It's something I wish Microsoft would have done a long time ago between the desktop, via Windows Explorer, and the Web, via SkyDrive. I think Docs is being renamed to suit it's new purpose as a repository files (photos, videos, and whatnot) you upload, and in the case of documents, files you create via Docs, and upload via the downloadable app. I don't think the name Docs is going away, but do think GDrive is just Docs renamed. You can have a submenu of Docs, Photos,... Like in SkyDrive. Right now Docs is 1GB, I have 5.25GB on Dropbox. Unless Google adds more free storage, I don't see me using it. 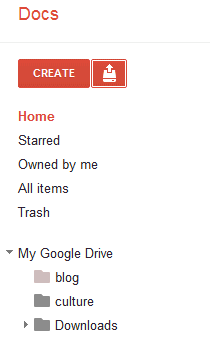 I do not see the point of Google renaming Docs to G Drive. It would be nice to have a place to see all of files you have stored on Google. An to have software to sync your desktop files to your on-line files or vis versa. Also it would be cool if they sort out there storage quota so the user has a single quota across all of Google services, it seem silly to have 1G for Docs, 1G for Picasa, unlimited for Google+ photos, 7Gigs for email, unlimited videos for Youtube, you get something like 20gigs for Google Music beta. Some unifications here would go well with there plans to unify there productions into a single platform under Google+ . I'll be happy if they provide unique, persistent, direct link for individual files on Docs / GDrive like Dropbox does. For example, right now, the unique link that I get for an mp3 file uploaded to Google Docs opens a webpage from where you can download the mp3, it is not a direct link to the mp3 itself. Too little, way too late. They should have launched this back when they first did it (back in 2006, before Dropbox). While a fully integrated, with all services and file formats, can only come from Google due to their public API limitations, there are already several 3d party tools to help. GDocsOpen helps open documents with Google Docs by double clicking on them in Windows. GDriveSync keeps documents synchronized local -Google Docs, regardless of which folder they are in or what local editor is used. There's already a free Dropbox clone for Google Docs called Syncdocs. Also on the storage limit Google Docs has unlimited storage for Google Docs files so for a lot of stuff if you convert when uploading it doesn't affect your limit. 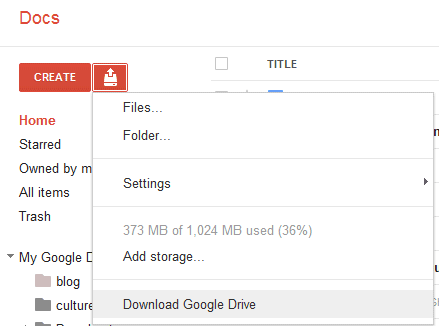 I would imagine that GDrive will have an increased free storage limit as a promo tool to encourage adoption. I tried to get the above trick to work but it says after doing the previous steps, "config is not defined (Reference Error)"
What is the name of the script that it is in? I'd just like to point out that "a software" makes no sense. Would you refer to "a hardware"? Software is a collective plural noun. Thus "a piece of software", just as we might say "a piece of hardware". I know language evolves and I've seen this usage numerous times, but I see it as a retrograde step and a sign of imprecise authorship. It seems like Google's closed the ability to right click on the interface of Google Docs...that's interesting. Aka, you can no longer automatically inspect the element--I tried it in Chrome and FireFox. Oh, and you can still right click on Calendar, Mail, Photos, etc. ONLY Docs, it seems, has restricted the ability to right click on the background of the page. That's promising to me at least! Skydrive will get some integration with Windows 8, but the big question is - Will it be possible to bypass that 100MB file size limit, and purchase additional storage space. 25GB's might sound like a lot, but when it comes to your photo and video memories, 25GB's doesn't go very far. As for G-Drive, the pricing model is perfect - what is missing is explorer integration in Windows. Once this launches (if it does) - I think both these services will undercut the likes of DropBox and other overpriced cloud services. I "Hope" that the GDrive is everything I want and more. Do I think they will increase the stroage yes - here is why. Currently with gmail you have over 7653 MB of space. Then you have space on Picasa 1024 MB, Docs 1024MB (which is different than Picasa space) and Music (20,000 songs about 50Gb - compared to Amazon 5gb = 2,000 songs). And lets not forget Youtube - which I don't think even has a cap on storage. If any one has looked into Google+ and the photo's they now pull into your Picasa account. they are $100 for 400gbs - better price I think so. So, is Google going to add more storage- Yes I think so! And I think they are going to blow dropbox out of the water. They have a lot riding on there new look they have been creating. It is all focusing around Google+. Of course I'm open to Ideas. See more of my post about Google Drive here. I spent a few days before Christmas moving everything to the cloud - google cloud in particular. Docs, Music, Files, All old email. I can't use Music yet so thats more of a backup thing (please bring it to Australia soon). BUT I am still struggling with using Docs as my main drive. I scan to harddrive and then upload to GOogle when I would rather scan to google direct as a drive on my desktop. I know there are other third party programs out there but I trust Google and would like them to launch a desktop extension asap. I even paid for 85gb of storage.